All bodies always stay on one line. Star is similar to sun by parameters. "Green" planet is Earth-like exoplanet with 1 earth-year orbital period, same mass and radius as Earth. It placed in L1 position between star and "grey" planet. More than that, "green" planet is tidally-locked between star and "grey" planet. "Grey" planet is rocky planet, what is larger than "green" planet. I'm not sure about real size of this planet, maybe half of Jupiter mass. It's interesting to imagine sky on dark side of "green" planet. Because observer may see "eye" in the sky, created by shadow of "green" planet. 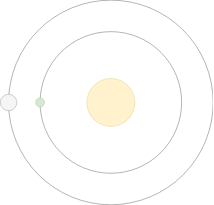 I was trying to recreate this system in Universe Sandbox 2, but seems, that mass of the planet doesn't affect orbital period. So if I change period manually, simulation just decrease distance between planet and star (semimajor axis distance). But as I understand from orbital speed formula masses of both bodies are important. So, can "Grey" planet have same orbital period (1 year) or not? It follows that to have the same orbital period, two bodies need to have the same semi-major orbital axis. Since this is not the case for your configuration, the answer is no, it is not possible. Not the answer you're looking for? Browse other questions tagged science-based reality-check planets orbital-mechanics tides or ask your own question.